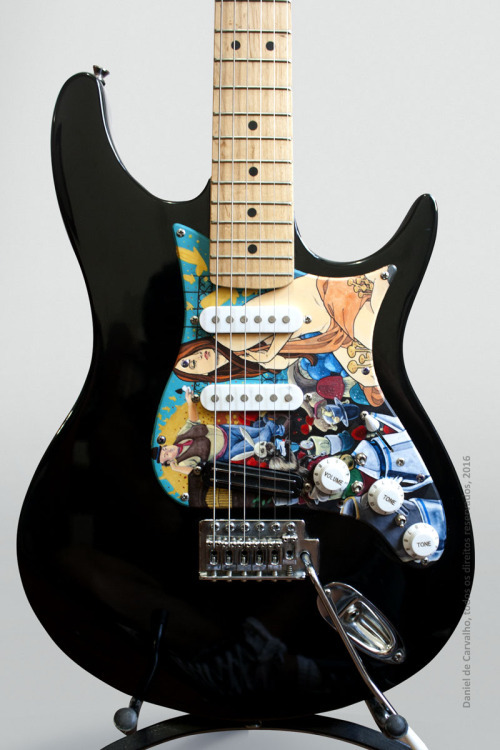 Continuing to the first part, I will now tell about how I modified the look of my guitar. I considered doing swirl painting or buying a customized pickguard online, but none of those options got me excited. After some time thinking and incubating ideas I started the composition by picking trippy and psychedelic elements, being Alice in Wonderland a huge influence as well as the line “The rabbit is just a monkey in disguise” of the song Organ Grinder by Marilyn Manson. Unfortunately, visual arts are not part of my skill set. 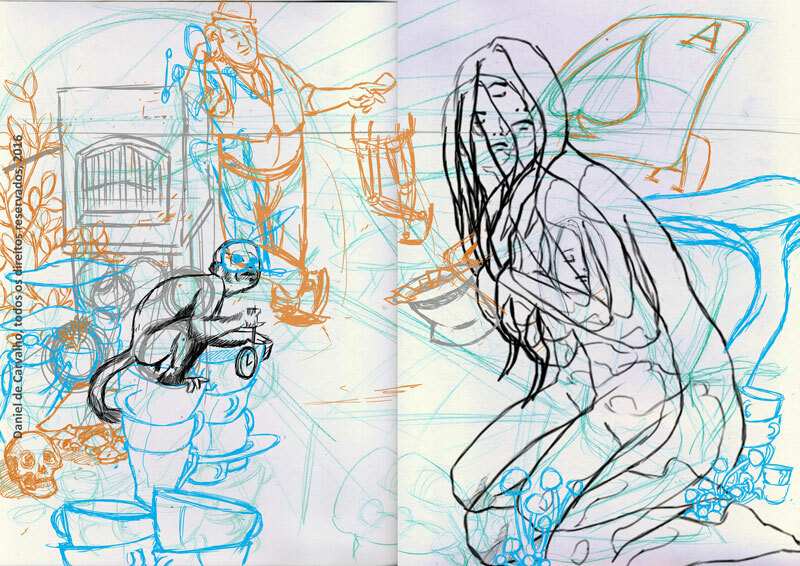 I contacted a friend artist (Daniel de Carvalho) with the ideas and soon he started to present me some sketches. Some months and some drawings later he started to work on the pickguard. He developed the art using acrylic paint and India ink. Check out more photos of the process and other works on his page, Daniel is a very experienced, talented and passionate professional. 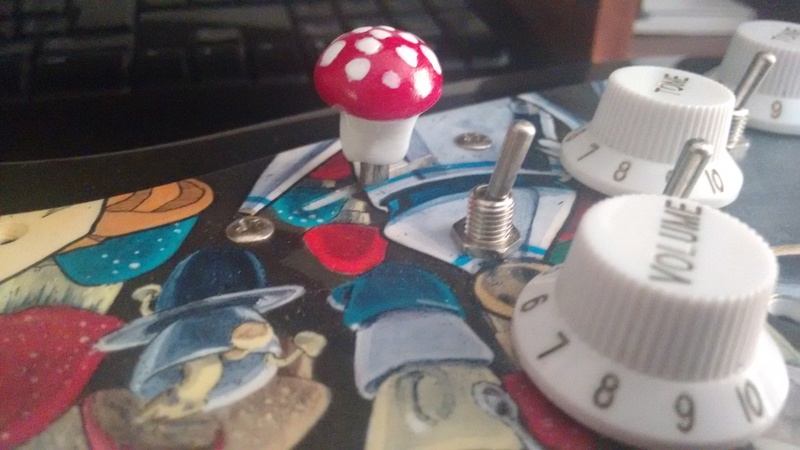 While assembling the guitar pickguard with Daniel, we come up with the idea of a mushroom pickup selector. I really liked the concept and resolve to try it out. I used a recipe of cold porcelain. To my surprise it’s a very cheap and easy to use material, I have some leftover and consider using it on other projects. I regret choosing nail polish for painting, it’s too thin and inconvenient to use. A friend lend me his electric guitar for quite a while when I determined to learn a string instrument. After a lot of months I finally got my act together and bought a cheap an inexpensive electric guitar bundle(with a 15-Watt amplifier, gig bag and strap). 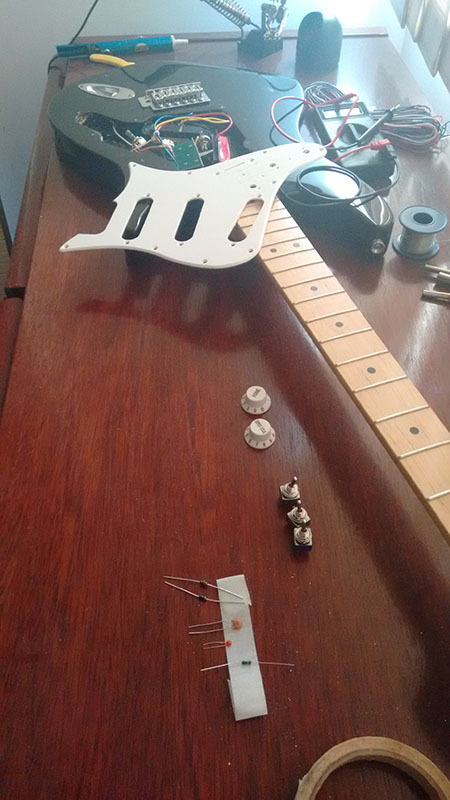 After a period of time it occurred to me to experiment, modify and change some aspects of the guitar wiring. All the applied modifications were found over the internet and, as you can imagine, there is nothing innovative. Switch between the original tone capacitor and a new one. Hard clipping using two diodes connected in antiparallel. 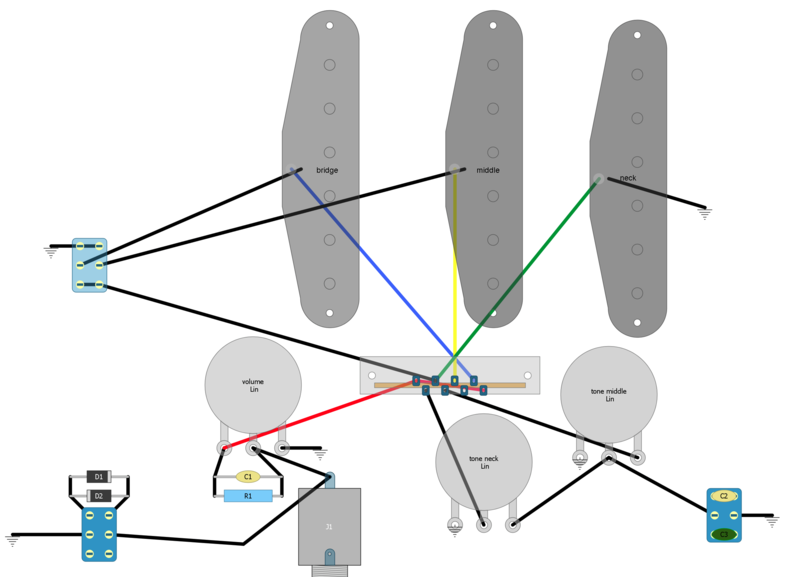 Neck ON Switch (David Gilmour wiring). It was a cheap guitar, however its value reflects its quality. I was a bit unsatisfied with its tone, with a little research I found out some ways to improve the tone. Simple selector between two capacitors. The second one helps to get a darker sound and not so strident like Stratocasters usually are. Sometimes called as “passive distortion” or even wrongly as “passive overdrive”, it’s a fun modification. Gives a harsh sound, but loses volume since it clips the sound without any boost. This wiring, when enabled, connect the neck pickup with whatever selection in the 5-way switch. David Gilmour may be the most famous musician to use this mod. Now with up to 8 possible combinations, the guitar has so much possibilities. In my opinion, the sound is colorful now. When you turn the volume down on a guitar you can feel that the sound loses a bit of treble. It happens because the pickup, the volume potentiometer and the capacitance in the cable act as a low pass filter. To compensate this loss we “bleed” more treble into the signal as the volume is turned down. After all that, I ordered and installed a hotrail pickup in the bridge position. Unfortunately I don’t have any pictures, but If I did it again today I would use the Gilmour/neck mod with the bridge pickup instead of neck. 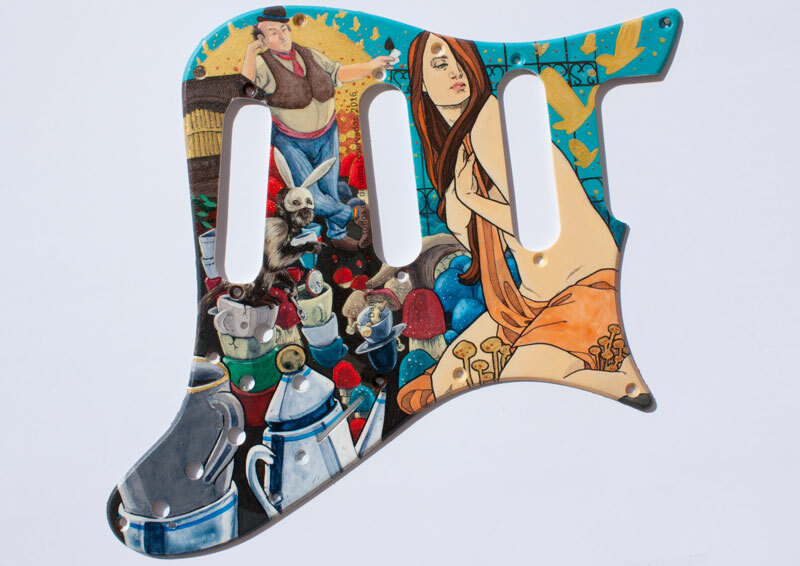 I customized the pickguard with an artist, that being the subject of the Part II of this post. I learned a lot in the process. From something stupid like how a 5-way switch works to something unexpected like fixing to a stripped screw hole.